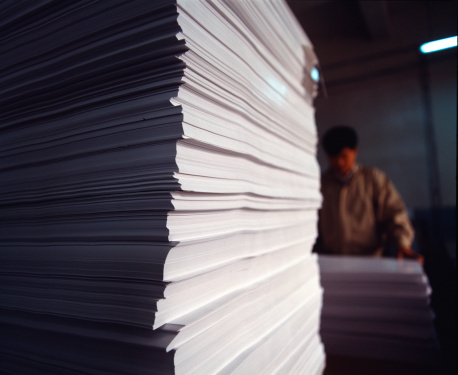 If you've ever stepped foot into a print shop or ordered a print job online, you've most likely been faced with what can be a daunting question: What kind of paper do you want? Then, that feeling of panic sets in, much like when you're faced with the paper or plastic question in the checkout line. Your mind races to quickly analyze "the most eco-friendly option" while the customers behind you silently judge you. Example: Bond paper has a standard sheet size of 17" x 22" (also called "basis size"). If 500 sheets of bond paper weigh 20 pounds, that paper is classified as 20 lb. bond. You might also see this represented as 20# bond. The basis size for book stock is 25" x 38", so 500 sheets of 30# Bible stock will weigh...you guessed it - 30#! Text stock is a higher grade of paper used in projects requiring a better quality paper. It's a bit thicker than your standard bond copy paper. Text paper is often used for brochures and flyers, some magazines, and thin posters. Text paper weights range from 60# to 100#. Cover paper (also called "card stock") is heavy paper used for projects like business cards, postcards, and rack cards. Like text paper, weights range from 60# to 100#. Because cover paper is a thicker stock, it has a smaller basis size (24" x 36") than text and bond papers. The equation is the same, though - 500 sheets of 80# cover stock is going to weigh 80#. As you may have guessed it, the heavier the paper, the pricier it will be. Some people may have the tendency to skimp on paper weights because they don't think it's that important. Psychologically, when people feel a lighter weight paper used on something they instinctively feel should be heavier, they make a value judgment about your company, product or service. Clearly, this is not a decision to be taken lightly.